Click for a Quote for Centipede Control Services Now! Centipedes are insects that are scientifically called Chilopoda. They're flat and have segmented bodies with each segment of the centipede having a set of legs (no, centipedes don't necessarily have 100 legs as their name suggests - it may be more or less!). They have relatively large sensory antennae and have venom glands. Centipedes forage for food at night and are attracted to worms and spiders. Often, where you find centipedes there are usually spiders to deal with, too. Their venomous bite paralyzes their prey. The bottom line for humans, and most certainly home and property owners - is that they're gross! They're night predators and are rarely seen in the daytime unless disturbed. Not only are they frightening to most humans, some can be dangerous as they can exact a bite. Centipede bites are often painful and can cause symptoms such as swelling, chills/fever, and weakness. Centipede bites are typically not fatal; yet large centipedes can trigger anaphylactic shock particularly among people with allergies or children (smaller centipedes often can't even puncture human skin). Identifying a centipede pest control problem is straight forward based on sightings, typically at night given they're nocturnal. 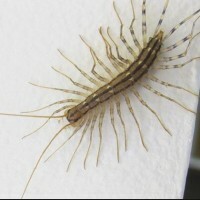 However, if there are spiders, worms or other vertebrate issues in your home or building then it is likely centipedes are lurking as they often prey on them. Centipede pest control extermination is a common solution to rid your home of centipedes. The important thing is, however, that the food source of the centipede is dealt with (extermination often takes care of the other problem sources of centipedes which is commonly spiders). In theory, eliminating food sources will see a gradual decrease in centipedes. Also, ensuring you eliminate dark, moist areas to the best of your ability is important - such as making sure moisture doesn't accumulate in bathrooms or basements. Items that contain moisture should also be kept away from the exterior of homes and buildings, as they often attract centipedes which may gravitate inside. Any obvious points of centipede entry should be addressed by caulking or otherwise sealing them.